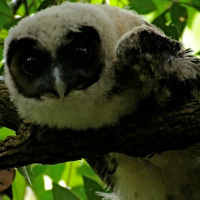 The Himalayan Wood Owl is a fairly large owl with no ear-tufts. 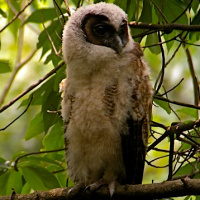 Some authors name this species the Mountain Wood Owl. Distribution: Pakistan and Nepal east to China and Taiwan and south to Indochina. Original Description: Hodgson, Brian Houghton. 1836. Asiatic Researches, or Asiatick Research (As.Res. ; or transactions of the society instituted in Bengal for inquiring into the history, the antiquities, the arts, and sciences, and literature of Asia) 19: p 168. See also: Other owls from The Middle East, Asia, Genus: Strix.